…the Asian buffet/pho restaurant down the street, Pho Kim Long, was hosting festivities. The hissing sound was sheets of firecrackers, and the bongo was actually somebody else with no natural rhythm playing drums. When I figured out what was going on, I couldn’t be mad. It’s pretty badass that we’ve got a vibrant Asian-American community in the heart of the city that puts on crazy celebrations in the parking lots of restaurants and grocery stores. And thankfully, unlike St Patrick’s Day and Cinco De Mayo, Chinese New Year hasn’t been appropriated by drunk bros… yet. If you thought that when Kevin Stitt said he’d run the state like a business that he meant restricting women’s rights to healthcare in a very dangerous and negligent manner, congratulations! Bring your bingo card up front and we’ll give you a voucher that you can exchange for a free Unconstitutional Court Battle at any of our participating locations. Between Calvey, Stitt, and Durant, Oklahoma sure has a Kevin problem. Did you know it’s also got a cream filling? WATCH: I go inside the @OkCountySheriff jail where there's human waste 'raining' from the ceiling. Ya know what a literal nightmare sounds like? Let’s start with a crumbling tower downtown where people are imprisoned, often for too long, and the floors are flooded with human excrement. It straight up sounds like a chapter out of Dante’s Inferno. If you missed this game, it was epic. I was at a friend’s house, and to be honest we kind of tuned the game out and paid more attention to our card game. As we made a beer/pee break, we noticed the Thunder were up by 2 points. How’d that happen? Thunder magic baby. This is really sad not only for Thunder fans who wanted depth on the bench, but obviously for Abrines as well. We don’t know what he’s going through, but it’s major enough that his NBA career could be coming to a close. Hopefully, he’s able to come out of his struggles and get back to a fulfilling life. FINALLY! Something in Lloyd Noble Center to not only be happy about, but to celebrate. Remember last week when I said OU may not win another Big 12 game? A recent Tweet compared OU basketball this season to OU football in 1996. OUch. When does baseball season start? Better yet, OU Softball just started, and they didn’t lose to a Big 12 foe last season. Unfortunately, the Pokes 90 miles to the north are not faring much better. The good news is the Aggies did manage to pull down a National Championship in meat packing or something like that. I bet it there’s a sign on 51 that will remind everyone. Better yet, maybe T-Boone can buy another football natty from the early 1900’s. Previous post News 9 reminds everyone they are locally owned…for now. Curbside flowers:)) Dig that, I’m always down with new ways to help out our homeless population. Sounds to me like the prisoners are causing the flooding by putting blankets, bedding, and whatever they can into the toilets. Perhaps they get what they deserve. Solution – STAY OUT OF JAIL. Here you go libs, give me a lecture about the poor prisoners! I won’t waste a good lecture on someone unfamiliar to the concept of decency. I guess with Trump at the “head” of your party you Republicans know all about piss. Perhaps some are too young to remember that the OK County Jail was plagued with numerous raw sewage leaks, along with a laundry list of other significant problems on the day that it opened. In fact, most of the problems currently being addressed existed on opening day. The building design was known to be critically flawed before construction began. Oversight of the design and construction was minimal at best and obviously ineffective. Consequently, this building will continue to be a financial sinkhole until the day that it is demolished. 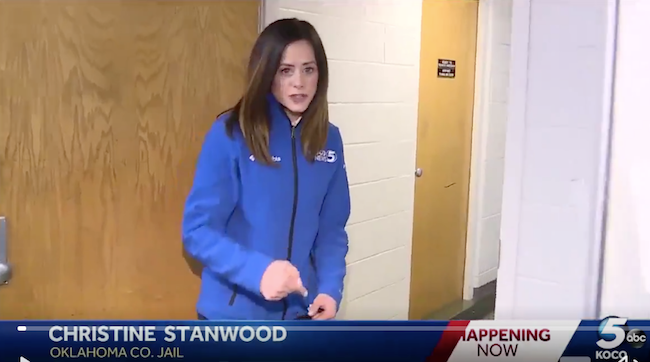 Bravo to Christine Stanwood for being on the scene and wading through the story! They didn’t send any Ogles to wade through the sewage!? No surprises here. GOP marketing FEAR FEAR FEAR. Enes Kanter – Steven Adams twin from another mother. (you weren’t expecting that Kevin fella were you). Evidently you have never read reports citing sewage problems created by faulty design, sloppy construction techniques and unauthorized substitution of lower grade construction materials. Add to this the fact that the building was designed by a company that had zero prior experience in designing jails. This building was plagued with these types of issues before it opened and inmates certainly have taken advantage at every opportunity . However, the inmate activities cited are but a symptom. Faulty design and construction is the problem. Continued efforts to address symptoms will never solve the problem and result in the continued waste of OK County taxpayer dollars. The Billionaires got the tax cut their lobbyists worked so hard to get. Clay Bennet is stepping down from the OU Board of Regents and I suspect that Ragina Gaylord is not far behind. Fifty years from now OSU will declare themselves the 1951 National Champions and the Oklahoma City Detention center will be carried away by a vast swarm of sentient bio-genetically modified bloatflies. See? Sometimes the glass is half full.